Like little geodes, these small stud earrings have recessed areas of sparkling texture. 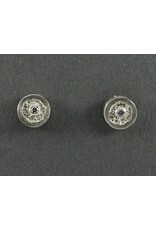 Recycled sterling silver with 1.7mm recycled white diamonds (.04 ct) sterling silver posts and backs. Bright finish, 9mm wide.